While holding the disposable cup, punch several holes at the bottom of the cup by pushing the heated nail. The heated pointed end of the nail would melt the plastic of the cup. The size of the hole must be big enough for twist ties to pass through. The shape of the created holes is insignificant. Punch the holes about an inch apart from each other. The holes become drainage holes. Excess water would flow out through these holes. The hole would allow the tying of the containers to a stable and sturdy object. Cut a piece of twist tie or thin wire to a length of around five inches. Fold the twist tie into a U-shaped pattern. Insert the two ends of the twist tie into two ventilation holes of the plastic stool from below. In the photo, you can see my arm and my hand inserting the piece of green twist tie from below the seat of the stool. Lay the disposable cup on top of the stool and insert the protruding two ends of the twist tie into two holes of the disposable cup. Take one of the mandevilla long branches and pass one of its leaf nodes in between the two projecting ends of the twist tie as shown below. 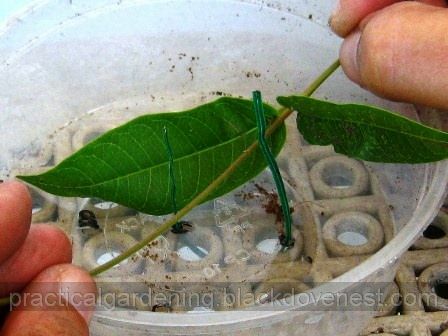 Put potting medium or soil (I use coco dust) under, around and over a leaf node of the mandevilla branch vine. Twist the tie wire to hold the branch in place. The twist tie secures the branch to the soil or potting medium in the container. At the same time, it also secures the container to the sturdy plastic stool. So the twist tie fastens the branch, the container and the stool altogether. Other than a disposable cup, you may also use a discarded margarine tub or a disposable plastic fruit tray as shown below. Although shallower, the disposable plastic tray has an advantage of accommodating more branches for soil-layering. As an alternative stable and sturdy object, you may also use an inverted plastic mesh bin or basket instead of a stool. Shown below is an inverted red mesh bin that was used for soil-layering purposes. The setup below shows the mesh bin taking on the shorter or lower branches of the vine. The plastic stool was used for the longer or higher branches of the mandevilla vine on the trellis. Use a hand sprayer to water the soil or potting medium of the soil-layers. This is to avoid or minimize splattering and disturbing the soil or medium. For mandevillas, water only when the potting medium's surface has dried. If possible, do not water everyday. Successful rooting times may vary. After a month, start inspecting for roots. Use a stick to poke through the soil or potting medium. If there are no roots return any dislodged soil back to cover the node. If there are roots, cut the branch with a pair of pruning shears or scissors. Cut from a quarter to half-inch below the roots. Shown below are the milky-white colored roots of the Mandevilla. 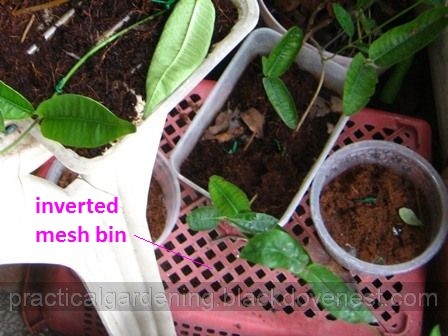 Plant the rooted soil-layered branch in a seedling bag.